Dogs Must Be Carried | Normative Signs: The Poetry of "Ought"
This sign is posted on the side of an escalator at Manchester airport in the UK. 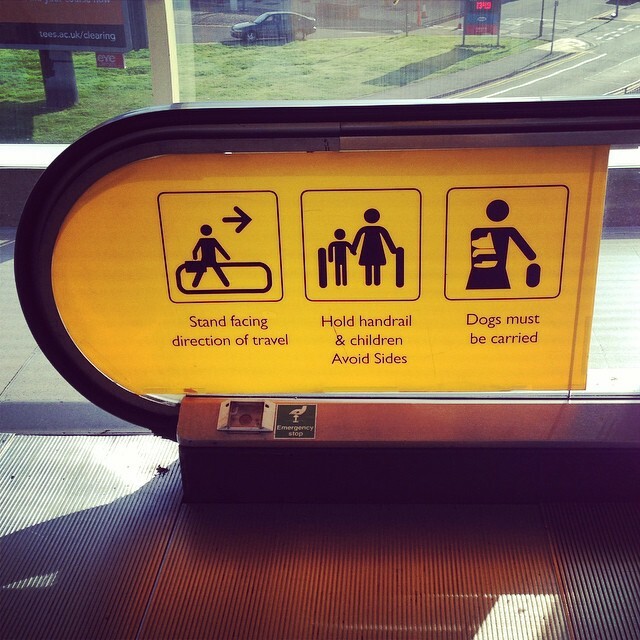 As the sender of the photo pointed out, it’s a very odd thing to require that one carry a dog in order to be allowed to use the escalator, especially given restrictions on bringing dogs into the UK. A passport surely must be carried. But a dog? But of course, what it really means is “those who have a dog with them must carry their dogs rather than letting the dog walk up the escalator.” But that’s rather a lot of words for a normative sign, isn’t it? Brevity may be the soul of wit, but it’s also the source of a lot of ambiguity. Thanks to Wayne Norman for sending the photo. Therefore… sight-impaired people with guide dogs must take the stairs, since they probably can’t safely pick up their German Shepherds? That seems like an odd rule.